I can’t believe it’s not goulash! Even in Hungary every home cook has their own version of gulyas or goulash as it has become known. Originally made by Hungarian herdsmen (gulyas) this thick soup, based primarily on onions, paprika and beef, has become the Hungarian national dish. Then there is porkolt. 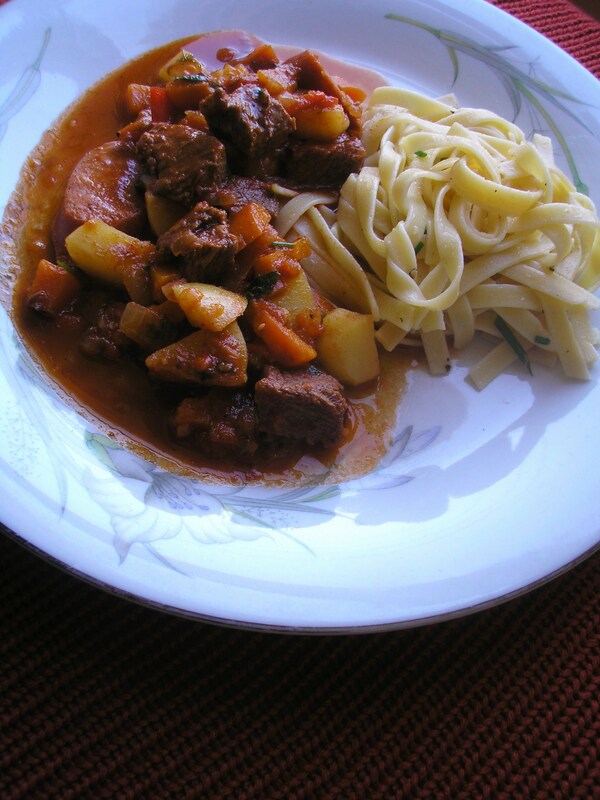 This is often confused with goulash the difference being that beef is not the only meat used and vegetables like carrots and potatoes are not added. Other variations include a Transylvanian dish known as tokany in which paprika is not the main ingredient the emphasis being on black pepper and herbs like marjoram instead and where mixed meats are used. There are also variations of goulash and porkolt throughout Eastern Europe; porkelt in Slovakia, porkolt in the Czech Republic and gulansz in Poland, a dish that blurs the lines still further as it is more like porkolt than goulash. Perhaps you can now see how people have become confused. My own version of goulash borrows from all of these recipes and adds a little sausage as well. It is not an authentic Hungarian goulash but it is still very tasty. Heat oil in a large, heavy based pot. Add onions and cook until translucent. Reduce heat and add paprika. Stir until paprika is lightly toasted but not burnt. Add diced beef, capsicum, carrots and caraway, toss well in the onions and paprika. Add 1/2 cup water, cook for 5 mins. Add the rest of the ingredients apart from the sausages, potatoes and parsley and simmer for an hour. Add the whole sausages and diced potatoes and simmer for a further 45 mins. Remove sausages and slice thinly, return to the pot and simmer for a further 15 mins. Add chopped parsley and serve with buttered noodles. To make your goulash more authentic omit the sausages, capsicum and tinned tomatoes. Use 800 g diced beef and use a bit more water. Simmer for 1 hour and 45 mins. Add a sliced green capsicum and a couple of diced fresh tomatoes, simmer for a further 15 mins. Add chopped parsley and serve. Everything old is new again, recycling clothing, growing vegetables in your back yard, cooking your own food. Along with this trend has come a nostalgia for foods we ate in our childhood. As a kid in the ’70s I remember a friend’s mother would make up a big pot of ‘Chow Mein’ on Friday night. The ingredients were beef mince, cabbage and a couple of packets of dried Chicken Noodle soup mix. This was the ‘rib sticking’ food that would feed her three kids for the weekend. It was cheap and tasted awful but, according to her mother, starving kids around the world would have been very pleased to have it! Other favourites were French Onion dip, a mixture of cream cheese and (you guessed it) a packet of dried French Onion soup mix. There were vol-au-vents made with chicken and a can of Cream of Mushroom soup, heated and spooned into little pastry cases. Chocolate Ripple cake was Chocolate Ripple biscuits sandwiched together with whipped cream, then covered in cream and refrigerated. Devils on horseback were prunes wrapped in bacon on toothpicks. In the ’70s anything could, in fact, be put on a toothpick – coloured cocktail onions, kabana, cheese, even tiny Swedish meatballs. All these dishes blur the line between cooking and assembling food. The other day I was reading some old ’70s cookbooks when it occurred to me that maybe some of the dishes are not beyond rescue. 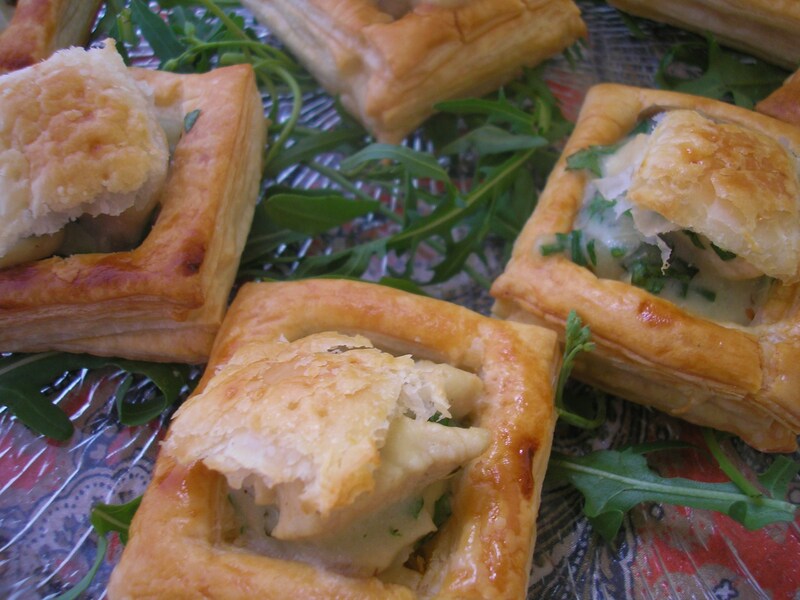 Vol-au-vents for instance, if you give the can of soup a miss and make the mixture yourself using free range chicken, real mushrooms, a bechamel style sauce and chopped fresh herbs. 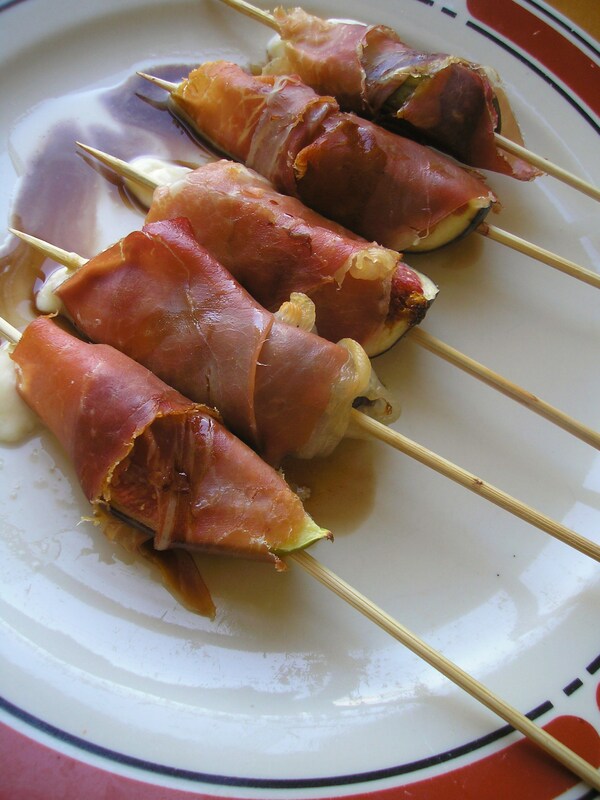 Devils on horseback could be a piece of ripe fig and a baby bocconcini, skewered, wrapped in a strip of prosciutto and warmed on a tray in the oven. I would finish with a drizzle of balsamic vinegar. Heat butter and olive oil in a heavy based pan. Add mushrooms, cook on high heat for a couple of minutes. Reduce heat a little and add onions. Cook for a further 2 mins. Add diced chicken and toss around with a spoon until chicken has changed colour. Reduce heat to low, sprinkle flour over the mixture and toss through for a minute or two until you have cooked out the ‘floury’ taste. Add a small amount of milk, keep stirring. Add the rest of the milk a bit at a time, stirring it through to avoid lumps. Add chicken stock and mix through. Cook on a low simmer for 10 mins. until sauce has thickened and chicken is cooked. Remove from heat, add Parmesan and chopped herbs. Season to taste. Cut your pastry square into quarters. Cut each quarter into quarters again. Place your squares on a tray lined with baking paper. Take two more pastry sheets. Cut in the same way. With a small knife cut squares out of the middle of each piece of pastry leaving a a border of about 1 cm. Paint the edges of the squares with egg wash. Carefully place the ‘frames’ on the pastry squares. Repeat until you have three layers of border. I used some of the middle bits, cut into strips, to bolster up the second layer as it becomes too wasteful for my liking. Just make sure you have a good frame on the top layer. Brush with egg wash and prick the base so it doesn’t rise too much. Cook on the top shelf in a pre-heated 220 c oven for 15 mins. turning once. Reduce heat to 200 c and cook for a further 10-15 mins. until lightly browned. Cool. Carefully cut out the center of each square with a sharp knife. Remove and set aside. Fill each case with the warm mixture. Place the little ‘hat’ you removed back on top. Warm in 180 c oven for 10-15 mins. Serve. 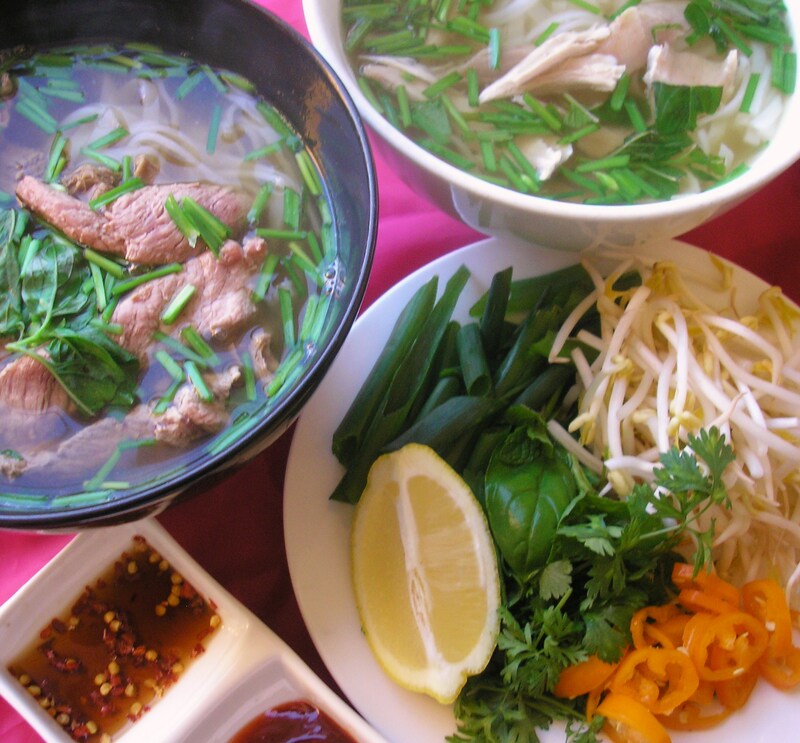 It’s so good pho you! Like dumplings soup is a much loved food throughout the world. For peasants soup was also a way to survive. Like most of the great foods soup was always a popular peasant dish as it is cheap and nutritious. One of the things that makes soup so good is the fact that the meat, vegetables and aromatics are cooked in the water you are going to eat so the nutrition stays in the dish. It doesn’t require expensive cuts of meat and it stretches the ingredients a long way. The stock can be made from the carcass or bones and lots of vegetables and aromatics with only a little meat added the end (if desired). Other additions that help to make soup more filling are rice, barley, pasta, noodles and the aforementioned dumplings. Because of its goodness and the ease with which it can be eaten, soup has long been regarded as a suitable food for invalids. 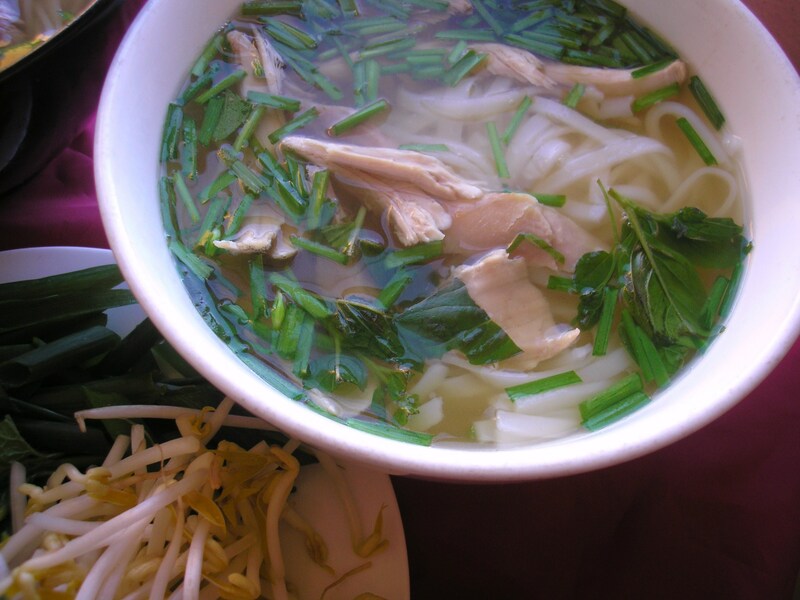 In Vietnam they often eat noodle soup or pho (pronounced ‘fer’) for breakfast. I’m not sure about breakfast but it makes a great lunch dish in winter and I find it is almost essential when I am trying to overcome a cold. 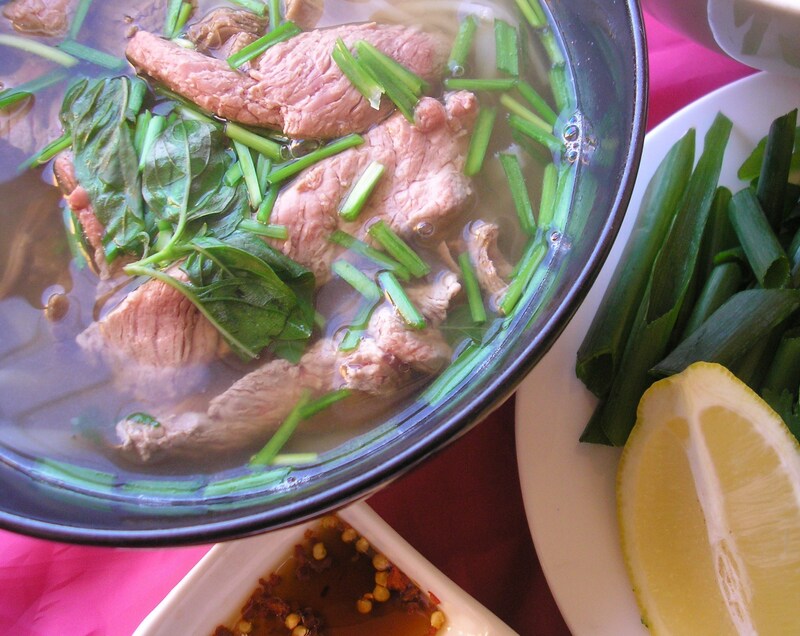 My favourite place to eat pho in Melbourne is Hung Vuong at 128 Hopkins St., Footscray. Just remember the small bowl is medium, the medium bowl is large and the large bowl is huge! With the cooler weather we have been having this summer and autumn and a member of my household feeling a bit ‘off colour’ I thought it was the perfect time to make a pot myself. I use the recipe from Maeve O’ Meara’s Food Safari cookbook. In the book she attributes this recipe to Angie Hong. Place the bones in a large pot and cover with cold water. Bring to the boil and cook vigorously for 3 mins. Drain off the water and rinse the bones. Wipe out the pot, return the bones to it and add 6 litres of water. Bring to the boil and reduce to a gentle simmer. Add the onion, ginger and the remaining stock ingredients and cook for 1 1/2 hours. Remove meat, cool and refrigerate. Remove the bones, strain the stock and refrigerate. Skim off the fat when cold. To serve, reheat the stock, check for seasoning. Thinly slice the cold meat. Prepare noodles according to directions on packet. Arrange the noodles in the bottom of deep serving bowls, top with slices of cooked meat and some of the thinly sliced raw sirloin. Garnish with onion, spring onion and coriander. Grind over some black pepper. Ladle over the boiling stock. To eat, taste the broth first, then add lime and chilli to your liking. Add generous amounts of bean shoots, basil and mint leaves. This recipe will serve up to 6 people. If I want to make chicken pho I use the same method substituting a chicken carcass for the beef bones, three chicken legs for the chuck steak and a chicken breast fillet that has been gently simmered in the stock for 20 mins. and thinly sliced for the raw sirloin.